According to research firm Markets and Markets, the digital out-of-home market will be worth $26.21 billion by 2023. Retail and hospitality are the main players in this commercial vertical, and the firm predicts that North America will dominate this market due to its early adoption of the latest display technology. But while digital signage is about displays, it’s not all about displays. “If you’re in the business of digital signage, you are now a digital experience designer,” said Laura Davis-Taylor, co-founder of The HighStreet Collective, a retail experience design firm based in Atlanta, GA. She noted that when she and HighStreet co-founder Ed King began working with digital signage 20 years ago, the focus was on delivering the right message to the right audience at the right time. “That has moved on, and a lot of that is because of the influence of Amazon and other cultural and technological factors.” Today, retailers are using digital signage as a measurement platform to determine, in a retail environment for example, how many people circulate through a store, what parts of the store they visited, and how long they spent there—the same type of data that can be gleaned from the back end of most commercial websites. 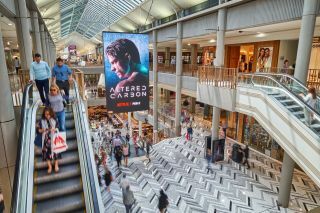 A NanoLumens digital signage deployment at Canberra Centre mall in Canberra, Australia. At Tightrope Media Systems, a developer of software-based, web-centric digital signage management solutions headquartered in Minneapolis, MN, the company’s president, Eric Henry, noted that a primary concern for the tech managers he interacts with is efficiency. “[Today,] everybody can pretty much do all of the technical things that are required to make something look good on the screen,” he said. “The shift is toward placing more and more screens within our facilities. How can we effectively manage all of the content, and the people contributing the content, in a way that’s useful without having to hire people—both on the content creation side as well as the administrative side?” Systems that can be managed from a central location, remotely, help to lift some of the workload involved in making all of the related devices communicate with one another. The shift toward placing more and more screens in facilities is increasing the demand for the ability to monitor systems from a central, remote location. NanoLumens’ Brice McPheeters advises setting clear long-term goals for a facility’s technology and implementing features in phases. It also comes down to whether people—en masse—are ready to interact with AR, King argued. “It’s not necessarily how good the tech is or how interesting the tech is, or if it’s actually to the point where it works consistently,” he said. “It’s: Will it fit into the lives, habits, and behaviors of today’s shopper? Yes, there are beacons, AR, VR, RFID—every day that goes by they’re becoming a little bit more accepted and acceptable in a retail environment, but not necessarily at critical mass yet.” What organizations need to examine is whether or not their target audiences will welcome these technologies, and if these deployments show potential when it comes to achieving business goals, such as increasing sales, engagement, and brand loyalty. While Henry believes that AR will be more prevalent in retail—initially at least—he does see its potential in wayfinding applications in corporate and higher education campuses as well. “There are some pretty practical ways of using AR that I think will show up in the wayfinding experience, similar to Google Street View: now I can see where I’m going, and what it’s going to look like when I get there,” he said.